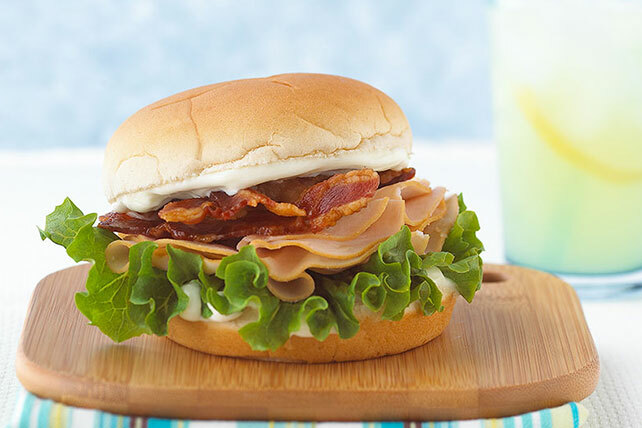 Get ready for the fastest turkey and bacon club sandwich you've ever made! If you're in a hurry, Quickest Club Sandwich is as easy to make as it is quick. Prepare using a plain bagel and substituting KRAFT Classic Ranch Dressing for the MIRACLE WHIP. Microwave 2 slices OSCAR MAYER Bacon as directed on package; use instead of the fully cooked bacon. Add tomato slices to sandwich.